Imported malaria occurs as a relatively rare event in developed countries. As a consequence, most clinicians have little experience in making clinical assessments of disease severity and decisions regarding the need for parenteral therapy or high-level monitoring. In this study, the diagnostic accuracy of procalcitonin (PCT) for severe Plasmodium falciparum disease was assessed in a cohort of 100 consecutive travellers with various species of imported malaria. In all patients, PCT was measured on admission with a semi-quantitative 'point-of-care' test. Patients with severe P. falciparum malaria had significantly higher median PCT levels on admission as compared with patients with uncomplicated P. falciparum disease. In addition, PCT levels in patients with non-falciparum malaria were also higher compared with patients with non-severe falciparum malaria but lower compared with severe P. falciparum malaria. At a cut-off point of 10 ng/mL, PCT had a sensitivity of 0,67 and a specificity of 0,94 for severe falciparum disease. However, at lower cut-off points the specificity and positive predictive value were rather poor although the sensitivity and negative predictive value remained high. Potential drawbacks in the interpretation of elevated PCT levels on admission may be caused by infections with non-falciparum species and by concomitant bacterial infections. Semi-quantitative determination of PCT on admission is of limited use in the initial clinical assessment of disease severity in travellers with imported malaria, especially in settings with limited experience with the treatment of malaria. Imported malaria occurs as a relatively rare event in developed countries. As a consequence, most clinicians have little experience in making clinical assessments of disease severity and decisions regarding the need for parenteral therapy or high-level monitoring. In addition, obtaining a correct diagnosis of malaria may be troublesome in centres where laboratory staff are less skilled in preparing malaria thick and thin smears and in the proper identification of the causative Plasmodium species and quantification of the parasite load . These centres usually rely on rapid diagnostic tests for the diagnosis of malaria. However, these tests do not provide any information about the severity of the infection, which is mandatory for evaluation of Plasmodium falciparum infections. Therefore, well-validated, simple, laboratory-based prognostic markers would be of great value in assisting clinicians dealing with returned travellers with malaria. Unfortunately, many laboratory markers including parasitaemia have poor sensitivity, specificity and predictive values for estimating the severity of disease . Procalcitonin (PCT), a precursor peptide from the hormone calcitonin, has been considered by some, but not all, to be a specific and useful indicator of systemic bacterial infections [3, 4]. Interestingly, elevated PCT levels (measured with quantitative assays), were also demonstrated in several patient series with malaria [5–11]. In the present study, the diagnostic accuracy of PCT for severe P. falciparum disease was evaluated in a cohort of 100 consecutive travellers with various imported malaria species. For this purpose, the PCT-Q® test was used, a semi-quantitative immunochromatographic "point-of-care" test, which, in contrast to quantitative PCT assays, allows a rapid measurement of PCT without a need for further technical equipment or support and can be easily incorporated in the initial clinical assessment of travellers who return home ill. The Harbour Hospital is a 161-bed general hospital located in Rotterdam, the Netherlands. It also harbours the Institute of Tropical Diseases, which serves as a national referral centre for tropical diseases. All patients reported herein were consecutive travellers diagnosed with imported malaria, who were admitted to the Institute of Tropical Diseases of the Harbour Hospital in the period January 2004 to December 2007 and participated in the PCTTM (ProCalciTonin in Travel Medicine) observational survey. The PCTTM was an observational study that had the aim of evaluating the diagnostic accuracy of the semi-quantitative PCT-Q® test (see below) in the initial assessment of travellers who return home sick after a stay in the tropics or sub-tropics. Of each traveller demographic, clinical and laboratory data were collected including a blood sample on admission for PCT testing. Patients were classified as having severe or complicated P. falciparum malaria if they met pre-specified criteria for severe malaria [2, 12]. Routine examinations included red blood cell count, haematocrit, white blood cell count, platelet count, serum electrolytes, total bilirubin, serum creatinine, liver enzymes, blood glucose and plasma lactate. Blood smears (thin and thick films), were obtained from finger pricks and stained with Giemsa and parasite counts were performed. Malaria was diagnosed by QBC analysis, PfHRP-2 screening and conventional microscopy with subsequent specification of the Plasmodium species (Plasmodium falciparum, Plasmodium vivax, Plasmodium ovale or Plasmodium malariae, respectively). In case of P. falciparum infections, parasite density was expressed as the number of P. falciparum trophozoites per 100 red cells in a thin film or the number of parasites per 100 white blood cells in a thick film. The parasite load was calculated from these figures using the actual number of white or red blood cells counted in the blood sample. PCT was measured with the BRAHMS PCT-Q® test (Brahms Diagnostics, Germany) according to the instructions of the manufacturer. PCT results were classified as follows: a negative result or a PCT < 0,5 ng/ml was classified as "normal"; a PCT of 0,5 ng/ml or a PCT between 0,5-2,0 ng/ml was classified as "low"; a PCT of 2,0 ng/ml or a PCT between 2,0-10,0 was classified as "moderate"; a PCT of 10,0 ng/ml and above 10 ng/ml was classified as "high" as recommended . All values are presented as median (range). For comparison between groups, the Mann-Whitney U test, Kruskal-Wallis test or Chi square test were used as appropriate. Post-hoc analysis was performed using Mann-Whitney U test. P values at α < 0.05 were considered statistically significant. One hundred patients with imported malaria were included in this study. Twenty-nine travellers acquired a non-P. falciparum malaria infection (P. vivax n = 23; P. ovale n = 4; P. malariae n = 2), 65 travellers had an uncomplicated P. falciparum infection, whereas another six patients had severe P. falciparum disease. Thirty-one patients with uncomplicated P. falciparum disease, one patient with severe P. falciparum disease and eight patients with non-P. falciparum disease were considered to be semi-immune or partially immune, respectively. As depicted in Table 1, patients with a severe P. falciparum infection had the highest serum CRP, lactate, creatinine, lactate dehydrogenase and bilirubin concentrations and the lowest haemoglobin concentrations and platelet counts on admission. As shown in Table 2, the median PCT concentrations differed significantly between the three groups (Chi-square 17.8; P < 0.001). The lowest median PCT concentration was observed in the group of patients with non-severe P. falciparum infections, whereas patients with severe P. falciparum infections had the highest median PCT concentration (Table 2). General characteristics and laboratory findings on admission of 100 consecutive travellers with imported malaria, subdivided by causative Plasmodium species and disease severity. 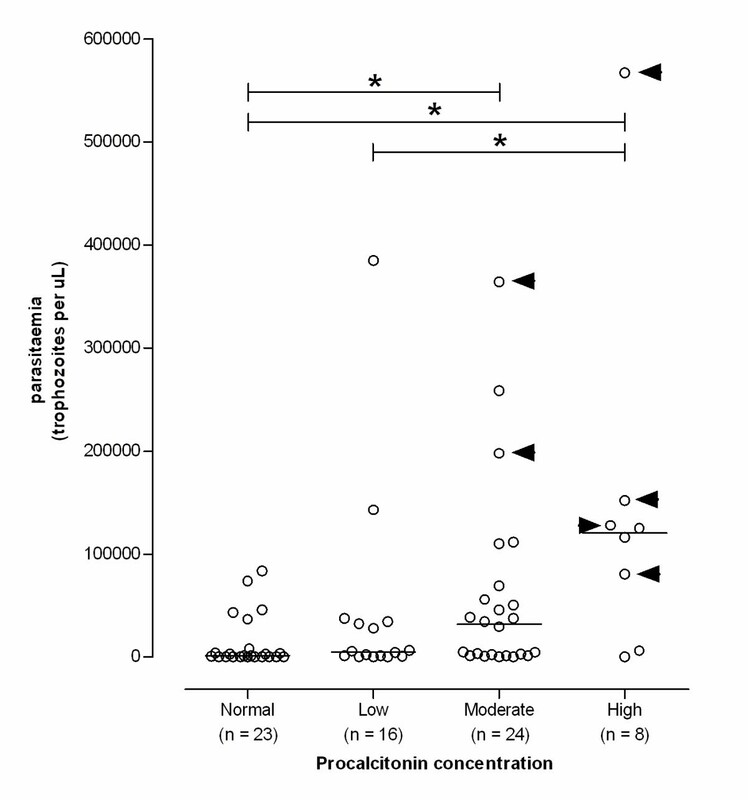 Procalcitonin (PCT) levels on admission in relation to causative Plasmodium species. When the groups of patients with P. falciparum infections were combined and analysed together, a significant correlation between parasitaemia and PCT concentrations was observed. Patients with a high PCT concentration had a significantly higher parasitaemia compared with patients who had a low or moderate PCT concentration (Figure 1). Interestingly, in all patients with severe P. falciparum malaria the elevated PCT levels on admission were classified as moderate (n = 2) or high (n = 4), respectively. Depending on the selected cut-off point (Table 3), PCT had an excellent sensitivity for severe P. falciparum disease, whereas specificity was poor. At a cut-off point of 10 ng/mL, the test characteristics became clinically relevant with a sensitivity of 0,67 and a specificity of 0,94 for severe P. falciparum disease. Procalcitonin (PCT) levels on admission in relation to parasite load in 71 patients with falciparum malaria. Bars represent the median value of each group. Arrow heads indicate the patients with severe falciparum malaria. Statistical analysis showed an overall statistically significant difference between the various PCT groups on admission (p = 0.0012). Post-hoc group-to-group analysis showed significant differences in parasite load (identified by the asterix sign *) between various PCT groups (Normal vs moderate, p = 0.0044; normal vs high, p = 0.0013; and low vs high, p = 0.0403, respectively). Descriptive statistics of the accuracy of procalcitonin (PCT) as a diagnostic tool for severe Plasmodium falciparum disease using various cut-off points. Data is shown as proportion [95% confidence interval]. In this study, a semi-quantitative PCT test was evaluated as a diagnostic tool for severe P. falciparum disease because this 'point-of-care' test may be easily incorporated in the initial clinical assessment of travellers who return home ill, without a need for further technical equipment or support. To that end, PCT levels on admission were studied in a broad spectrum of manifestations of imported malaria, ranging from uncomplicated to severe P. falciparum malaria, as well as in non-falciparum malaria. Interestingly, in all patients with severe P. falciparum disease a moderate to high level of PCT was seen on admission, which agrees with observations made by others [6, 8]. Some authors even suggested that an elevated PCT has prognostic value based on observations that PCT levels > 25 ng/mL were related to a fatal outcome in six of seven patients with severe P. falciparum disease . However, these assumptions were not validated in some other studies where PCT levels on admission were even higher (up to 662 ng/mL) but without associated case-fatalities . Interestingly, although severe or fatal malaria rarely results from infections with the non-sequestering Plasmodium species, P. vivax, P. ovale and P. malariae, increased PCT levels were observed in the majority of these patients on admission as well. Although speculative, these findings may imply that the mechanism whereby PCT levels increase in severe P. falciparum disease do not accurately reflect pivotal pathophysiological events in complicated P. falciparum disease, like sequestration of infected red blood cells in the microcirculation of vital organs. Rather, the elevation of PCT may be the result of activation of a common host response to malaria parasites. In fact, some even suggest that P. falciparum malaria per se is not associated with a stronger host response than P. vivax or P. ovale malaria, but that the density of the infection of the causative Plasmodium species influences the extent of the host response . In the present study, PCT had an acceptable to excellent sensitivity for severe P. falciparum disease and a high negative predictive value. Given the low percentage of false negatives (i.e. patients with a low PCT on admission who nonetheless experienced a complicated course of malaria), the use of semi-quantitative PCT levels on admission to guide to treatment, would result in only very few patients with severe P. falciparum malaria being denied high-level monitoring and intensive treatment. However, the specificity and positive predictive value of the semi-quantive PCT test were rather poor. Applying semi-quantitative PCT levels on admission as a guide to therapy would therefore lead to a large proportion of patients receiving more intensive monitoring and treatment than strictly necessary. In our opinion, only at a PCT cut-off point of 10 ng/mL for severe P. falciparum disease, the test characteristics were clinically valuable. Moreover, in settings were the prevalence of malaria is lower than that reported herein, the positive predictive value of PCT will probably be even lower resulting in more false positive tests. Possibly, the overall sensitivity of PCT for the prediction of the course of malaria, could be improved if PCT was measured more precisely by use of an ultrasensitive PCT assay instead of the semi-quantitative assay used in this study. Several studies have directly compared the performance of both techniques and demonstrated satisfactory but not complete, concordance [13, 15]. However, in the latter study , a satisfactory concordance was only reached when results in the next category were included to account for readout errors, which may further compromise the applicability of this semi-quantitative test in clinical practice. Another drawback on the use of PCT for estimating malaria severity might be the occurrence of bacterial co-infection, which may also lead to elevated PCT levels on admission. In a large French intensive care unit study on imported severe falciparum malaria, 13 of 93 (14%) patients with severe imported malaria were diagnosed with a concomitant bacterial infection, which contributed to a poor outcome . However, in this study, blood cultures were routinely taken on admission in case of fever and remained negative, making the occurrence of concomitant bacteraemia a less likely event. Severe P. falciparum disease and non-falciparum malaria are associated with elevated PCT levels on admission. Although determination of PCT may be of some help in the initial clinical assessment of disease severity in travellers with falciparum malaria in hospitals with extensive experience with the treatment of malaria, the overall test characteristics were too poor to advocate a general use of this semi-quantitative PCT assay. Potential drawbacks in the interpretation of elevated PCT levels on admission may be caused by infections with non-falciparum Plasmodium species and by concomitant bacterial infections. The authors gratefully acknowledge the help of Mr. Rob Koelewijn in collection of the patient data and samples for laboratory analysis and Ms. Corine Stuij for expert secretarial assistance. DAH participated in the data collection, performed the statistical analysis and data interpretation and contributed to the writing of the manuscript. JSB and HBT participated in the data collection and contributed to the writing of the manuscript. PP performed the procalcitonin assays, undertook the data collection and contributed to the manuscript. PVG conceived and designed the study, carried out the main analysis and wrote the manuscript. All authors approved the final version of the manuscript.